Intrigued by the possibilities of powering watercraft electrically, Go-Float founder Bart Jones started building hand-fashioned electric boats in early 2001. 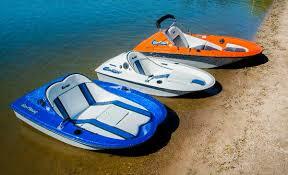 Over the next few years, Jones built many fiberglass boats powered by numerous configurations of electric motors. In search of the right combination of efficiency, performance and enjoyment, Go-Floats evolved through many iterations. Early in the developmental process Jones realized that his boats were fun to use at Big Island, a local hot spot on Lake Minnetonka, a popular lake located west of Minneapolis, Minnesota. On most sunny weekends hundreds of boats congregate, rafting up to socialize at Big Island and Jone’s electric boat was the perfect size and power option to flit from boat to boat visiting friends. Thus the name “Go Float” was coined as he would go from boat to boat stopping to visit along the way. The Go-Float’s electric power captured enthusiastic curiosity with its quiet operation, no need to refuel and comfortable ergonomics. That easy operation has become a company hallmark and manufacturing mantra finding attraction with kids, women and other fascinated boaters.